At the event, which was held indoors at the War Memorial Auditorium due to inclement weather, Lee bet on a resurgence of vocational education, something he said will help Tennessee be among the top tier states in education. Republican Bill Lee pledged to work toward creating safer neighborhoods and acknowledged his administration will face challenges with the opioid epidemic and access to health care, after he took the oath of office Saturday morning to become Tennessee’s 50th governor. "These are the challenges of our day," Lee said at the swearing-in ceremony, called "Believe in Tennessee." "And history will judge us based on how we meet them." At the event, which was held indoors at the War Memorial Auditorium because of inclement weather, Lee bet on a resurgence of vocational education, something he said will help Tennessee be among the top-tier states in education. 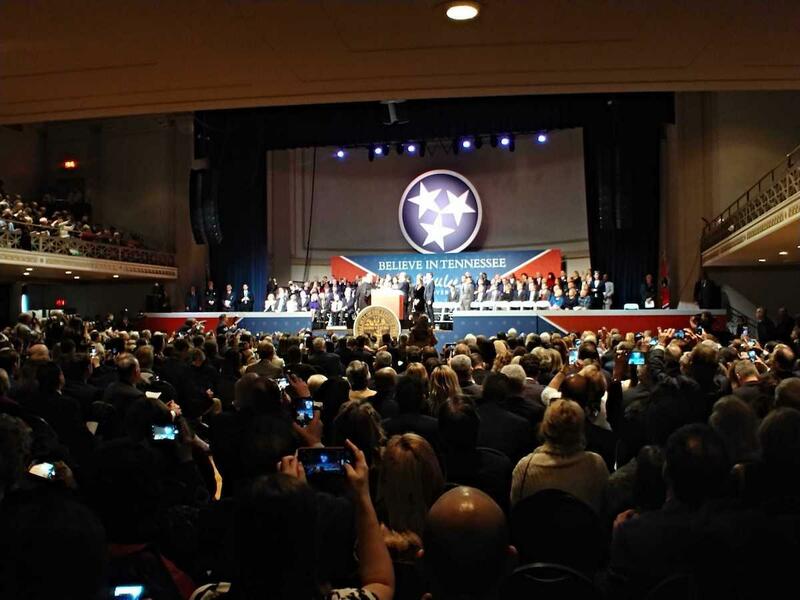 Bill Lee's inauguration, billed "Believe in Tennessee," took place at War Memorial Auditorium. Among those who attended the ceremony are U.S. Sen. Lamar Alexander, Republican U.S. Rep. Chuck Fleischmann, former Govs. Phil Bredesen and Don Sundquist, and state legislators. Senate Minority Leader Jeff Yarbro, D-Nashville, said he likes Lee's priorities, but added it will come down to the governor working with the legislature to accomplish them. "If we are going to solve the opioid epidemic, to provide health care access, it's gonna be real work," the Democrat told WPLN. "We'll see what that means." Lee replaces term-limited Gov. Bill Haslam. Haslam, who spoke briefly at the ceremony, wished Lee good luck and said he is confident his successor will better Tennessee. "Mark my words: Bill Lee will be a great governor," Haslam said. "Eight years from now — not four — eight years from now, we will be paying tribute to the great job (of Lee)." Lee's marathon-like inaugural day started at 8:30 a.m. with a worship service at the Grand Ole Opry House. The public event included performances from Nicole C. Mullen and Michael W. Smith. Reporters were banned from recording audio or video inside. A spokeswoman for Lee said the decision was because of "house rules and the performers that are working with." Inaugural celebrations, including the prayer service, were paid for with private donations. Lee has stated he wants to make transparency and open government a priority in his administration.